Recently, we’ve been working with HTC to bring VRidge to their HTC Vive Focus headset. It works really well and now we have started Beta tests of this version. The Focus headset with VRidge supports full positional head tracking and 3-DOF hand controller that works with VRidge too. 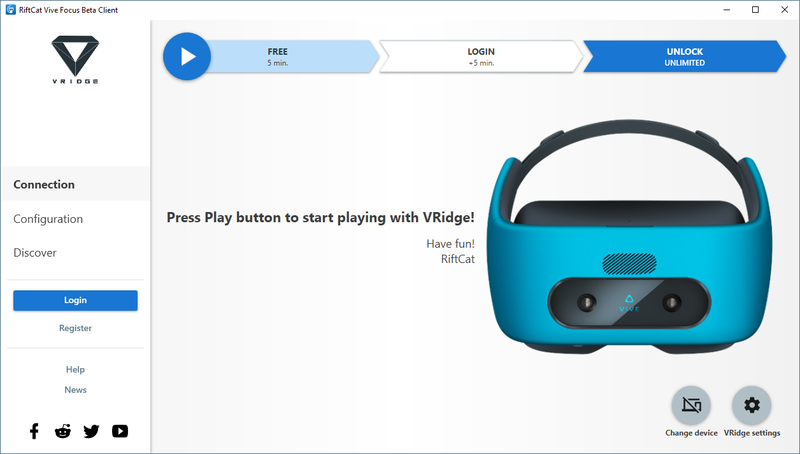 We will slowly merge this Beta with our normal RiftCat client so Vive Focus headset support will become a part of normal VRidge user experience. This Beta is important for other VRidge users too! While working with Focus, we’ve been working on many improvements to tracking algorithms. They are being used in Focus version and we will bring them to normal RiftCat soon so everyone will be able to use these improvements. When we were optimizing our streaming technology for higher frame rates, we managed to find several places where we could improve smoothness. We expect that we will see quite noticeable improvements when it comes to the jittery rotational feeling because most of those improvements will also apply to Gear VR and Daydream flavors. We also found several new paths to explore that would improve it even further. As HTC Focus has one 3-DOF hand controller included, we added support to it. This required us to create a special “body model” that will be used for further updates. It feels quite natural but the best part is that we can easily use it for other controllers. We plan to apply this model to Gear VR controller and Daydream controller. The controller automatically maps to you left or right arm model, depending on settings in your Vive Focus Viveport Dashboard. Similar option will be included for other 3DOF controller HMDs. With the work that we’ve done to Vive Focus - we prepared necessary groundwork to bring VRidge to other AIO headsets. Oculus Go will probably be the next one so stay tuned! Beta for Vive Focus starts now. Go to http://go.riftcat.com/focus to download special client which can be installed side-by-side with regular RiftCat software. The client is compatible only with Vive Focus HMD. We’ll focus on merging the improvements back to main VRidge now so everyone can benefit from improvement smoothness. Once it’s merged, we’re going to look more closely into Oculus Go. Tried to use with my Vive Focus but could not get connected. Started up the client on my pc then started the VRidge app on the Focus but no connection. Any advice? Will arCore 6dof tracking make it in the next release, since the bug has been fixed for Galaxy s9? I can't download the app on my Oppo A57 phone. Are yo try to support full positional head tracking since smartphone have camera what can be used .And great job on already supporting 3-DOF hand controller Gear VR controller and Daydream controller. I downloaded VRidge Beta from https://riftcat.com/focus onto a windows 10 PC and then downloaded VRidge beta onto my Vive Focus running the latest build of Vive WAVE SDK and I'm not able to connect to it. Can you provide some response as to whether certain settings need to be tweaked on my router? I'm running an ARRIS router from Time Warner / Spectrum and I'm wondering if its a firewall or other 5G setting I need to tweak. Dunno if we can pair 2 GearVR controller simultaneously in 1 device, then if we can map devices to each hand, that will be the next killer feature of Riftcat. I'd gladly pay extra for that.